The quiet before the holidays? There just weren't that many fishermen out or much of anyone out the week before Christmas. Just as well...it was darned cold and windy earlier in the week. CRAZY COLD WEATHER FRONT HITS WITH WINDS EARLY IN THE WEEK! Not much fishing earlier in the week when both winds and low temperatures contributed to less than ideal fishing conditions. Night time temperatures dropped unbelievably into the frosty 40’s and daytime temperatures barely above 60 some days. Add blustery wind and it was better for us to tell just some of our fishing clients who had extra days to just hang out in town and wait until things got better. For most, it turned out to be a better move. As the week went on, it settled a bit although remained chilly. One thing folks forget is that when it’s really windy, it’s not just tough fishing, but also can be very difficult to get live bait which compound efforts. So, later in the week when things calmed down a bit we were able to get some sardines and using both sardines and slow trolling smaller crank baits and shiny spoons, we got into some nice sierra up to about 5 pounds inshore both off Bahia de Los Muertos as well as in La Paz Bay. 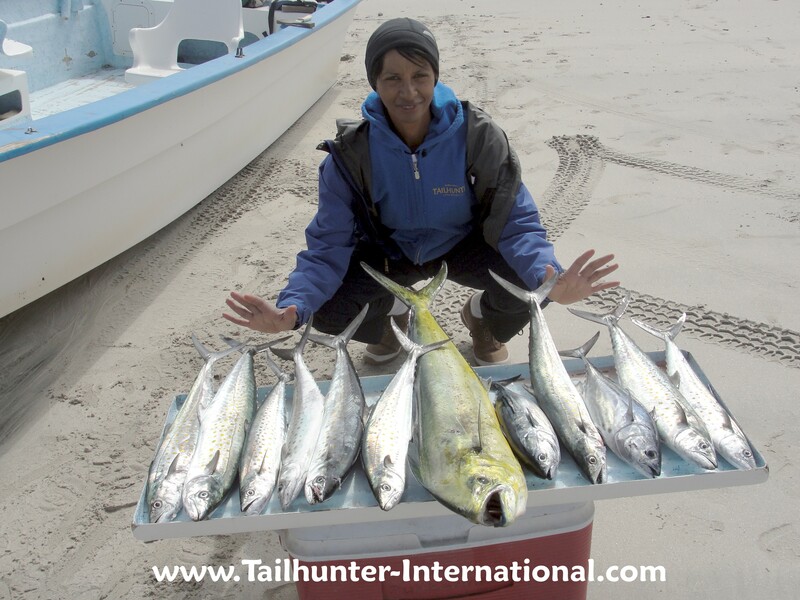 As well, some decent cabrilla helped top off the fish boxes plus a few stray dorado were caught up to about 10 pounds. There were report by some of the commercial guys of hooking some tuna near Cerralvo Island, but when we went out to confirm, nothing showed up as rough off-color waters were left over from the winds. We also got reports of some big squid that were caught as well. We’ll keep an eye out! We don't catch alot of these during the prime-time part of the season, let alone the off-season during the winter, but these colorful hard-fighters are called palometa jacks and we've probably gotten more in the last 2 weeks than we've gotten in the last several seasons combined. Schools of the good-eating fish are congregating just offshore at the drop-offs near the reefs and beaches. Tim Zimmer got a handful just off the beach behind him of east Cerralvo Island. It's a pretty simple formula. When the wind doesn't blow we're still able to get dorado even this late in the season. If the wind DOES blow, it gets pretty scratchy. Verdo Boyd fished with us a number of day over the past week-and-a-half and did a pretty good number on a variety of fish including dorado like this one. She was fishing with Captain Jorge. Tim Zimmer fished with us a bunch of days since last week and shows off a pretty typical catch right now with a mix of sierra and the occasional dorado. He's posing here on the beach at Bahia de Los Muertos near Las Arenas. It's been a long and crazy year! However, we count our blessing each day and thank you for being a part of those blessings. Enjoy the holidays and may the new year bring you all things good and thank you for asking us to share in the smiles all these years! You're the best! The early part of the week was really quite nice fishing. It was cloudy and overcast, but not cold and best of all…not windy! Nice and flat. And the fishing surprised us. 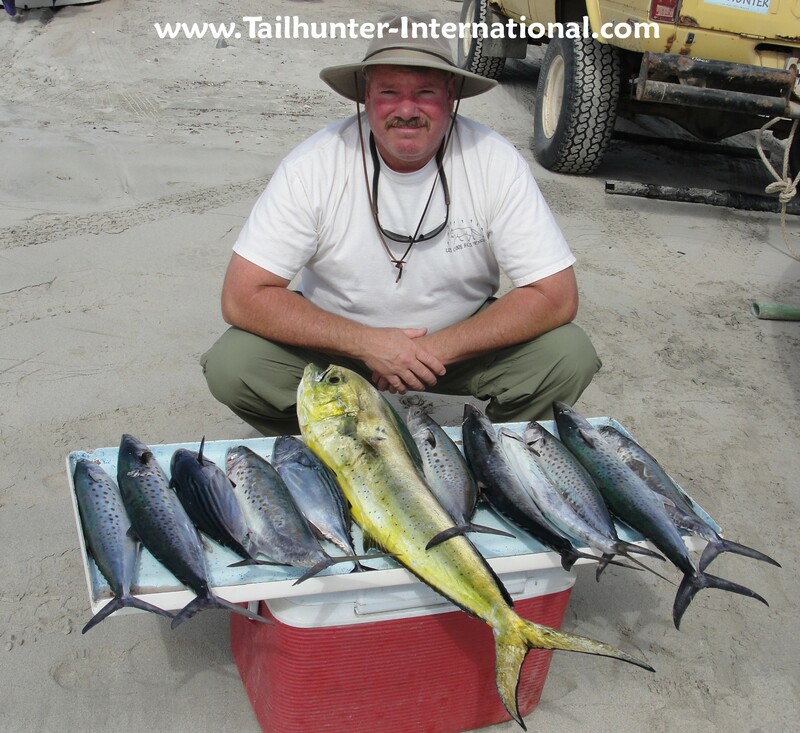 Good catches of dorado up to 20 pounds were hitting just out of Bahia de Los Muertos as well as south side of Cerralvo Island. One private boat of amigos went out to the 88 and said it was “unlimited” dorado fishing…”catch and release as fast as we could go full speed!” All of this in winter! As well, there were the bread-and-butter fish…sierra willing to go as well. Our boats were averaging about 4-15 nice sierra with some up to 5 pounds and when a good school was found, the fish were voracious! In addition to the sierra, we also found some surprising palometa schools which are members of the jack family…sort of like a greenish/yellow jack crevalle. Great fighters and good eating as well! A bit like pompano. Some of the commercial guys out there were thick into the fish. Saturday, the winds died down again and the fish popped back up…it’s going to be a typical pattern during the winter. But that’s what it’s like this time of year. Everything is variable and you just have to roll with whatever is biting. Yes! 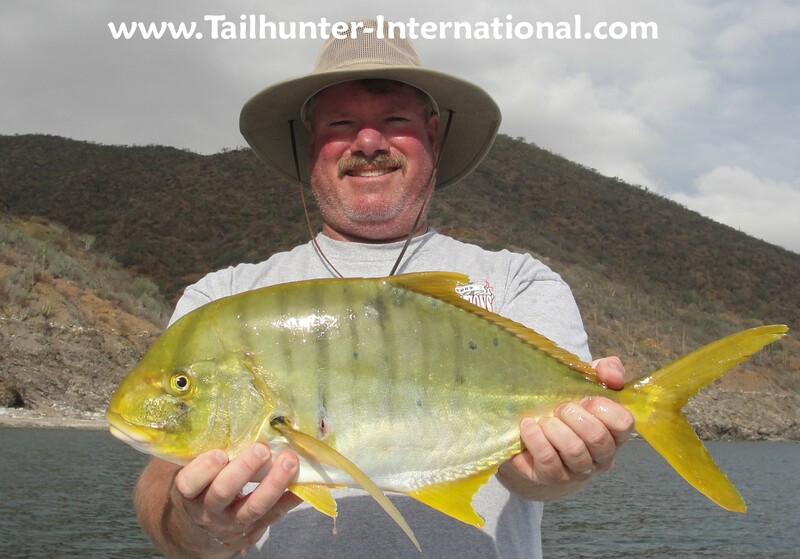 Even tho' it's a tad chilly out there and it's December, we got into dorado again as some of the better conditions of the month came out and the winds laid down allowing us to get some blue-water species like Tim Zimmer's Dorad held by Captain Jorge. The "blue water" fish was only caught about 1/4 mile off shore. Don't have to go far! It's a completely 180 degree catch! Sierra are thick and normally caught in winter when waters are cold. 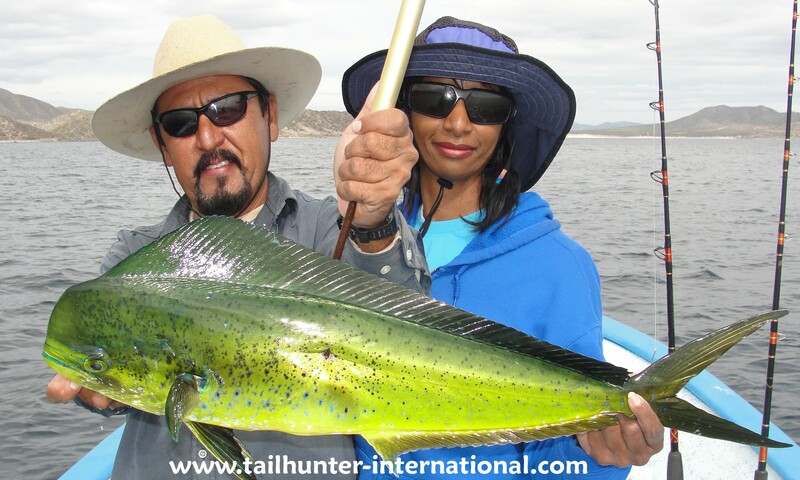 Dorado are warm water fish that we usually catch in the summer and fall! But both species are hitting this past week with our pangas out've Bahia de Los Muertos with our amiga, Verda Boyd, just retired as a sherrif's officer enjoying her new "permanent vacation status!" Boats were averaging 1-4 dorado per outing and limits of sierra. 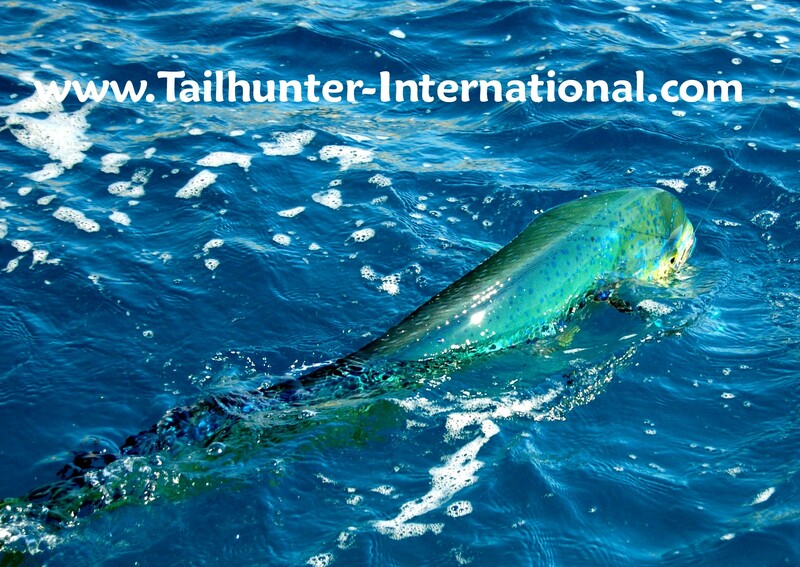 BEST CONDITIONS IN AWHILE ALLOW US TO CHASE SOME DORADO WHILE STILL WORKING INSHORE! It’s hard to keep calling these wacky weather weeks. It is what it is. It’s winter now. Some days are incredibly windy. They are the kinds of days you just should not be out there. The next day it’s flat and sunny. The next day it’s cloudy. Winds can shift direction half-a-dozen times in a day. Fortunately, this past week were one of the calmest weeks of the last month or so. The week started out like a wind-tunnel, but just as suddenly, it shut off and we had a number of cloudy, but just slightly breezy days that allowed us to work outside a bit for some species we normally wouldn’t be getting right now in winter. There aren’t that many fishermen in town right now. It’s that lull between American holidays of Thanksgiving and Christmas. La Paz is getting in to “Christmas mode” with decorations and evidence of the approaching holidays. We’re seeing more trees and lights and other Santa paraphanelia although, in truth, since there’s no Thanksgiving here in Mexico as it’s an American holiday, Christmas decorations started popping up right after Halloween. Anyway, as far as fishing, on the calm days, like I said, there’s some nice species out there. We continue to find flurries of dorado around both Espiritu Island and Cerralvo Island and some breezing tuna were also encountered in the channel out to Cerralvo. Fish were football 10-20 pounders but moving fast and just a few were caught. Dorado can still be up to 30 pounds, but most are 10 pounders. Roosterfish, sierra and pargo can be found inshore in most places where there’s some kind of underwater structure. The two most prominent species are the sierra where you can load up your fish box pretty fast if you hit the school just right. 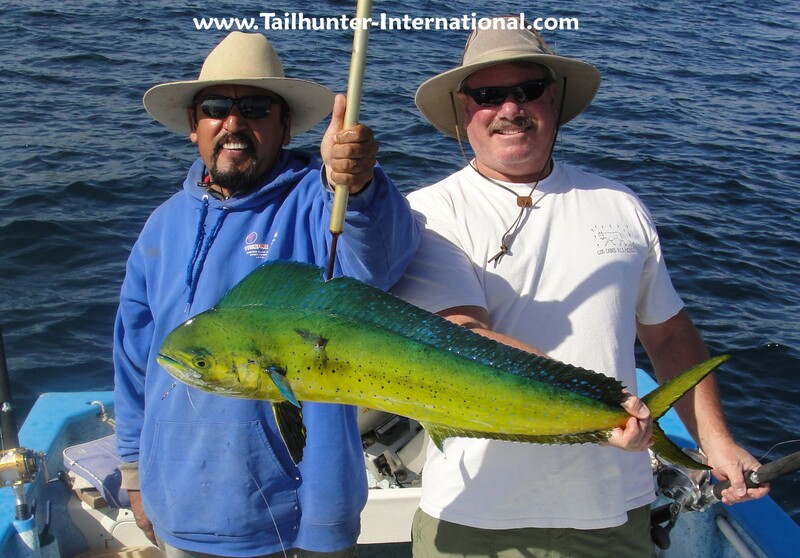 And then the surprise dorado that are running about 5-15 pounds are producing about 1-4 per day. We’ll keep you posted! Hope the holidays are treating you right! A late season resurgence of dorado was a nice surprise this past week. Although wind is still an issue, in between flurries or on the days when the winds lie down, dorado were coming up around Cerralvo Island in pockets or warmer water. Nothing big, but some fun 10-20 pound fish were caught like this one that was photo'd just before it was released and caught east of Ventana north of the Las Arenas lighthouse. Again, it's pretty late to see wahoo pop into the counts, but after waiting all year for wahoo in what has been one of the poorest wahoo season in many years, a few of the big skinnies were taken sporadically off the north and south end of Cerralvo Island. Fishermen in the areas said it wasn't consistent and if you go there be ready for some possibly rough water and wind as both areas take currents from all directions which can be exacerbated if the winds are blowing. As one of our anglers said, "We were soaking wet, but it was worth it to finally get a wahoo." Our amiga, Sue Paul, holds up one that she took at north point. As I’m writing this, it’s raining in La Paz. It’s been an up-and-down week for weather which has reflected in the fishing. Although this is the first real rain, it’s been threatening some days. Other days it’s windy. Other days it’s bright sunny perfect. This is pretty typical for the change-in-season ,but I had to say, it’s gotten cooler faster than I remember. Many of us locals are already wearing jackets and long pants and it never hurts to keep a sweatshirt handy if the winds come up and it gets a little chilly (chilly for us!…the tourist think we’re nuts!). Anyway, the fishing is pretty much dictated by the weather conditions which obviously dictate the water conditions. I’m not so worried about a little bit of rain. Yea, it’s cooler and you might get a bit of wet…it never lasts long. But, even when it rains, normally, there’s not alot of wind so you can still get into some decent fishing. If there’s wind, that’s when things are not so good. Wind churns up waves and chop. Wind brings surf and turns up the water, especially in the areas where we have to look for bait in the shallow areas. If the winds are over a few days then the water can get really turned up and green and cloudy. Not so good for fishing…at least not for pelagic species like the dorado and billfish and maybe even some tuna that are still out there…if you can get to them…if the conditions are right…if the water is not turned up and if you can get bait! That’s alot of “if’s”. But even when it’s windy, at least there’s some good inshore fishing to be had. This past week, we still got into good numbers of sierra, cabrilla and snapper. Some of the sierra this year are already some of the larger sierra I think I’ve seen in awhile. I kid you not when I say, they look like baby wahoo! Teeth and sleek! Some 5 pound sierra are not uncommon. That’s a nice sized fish, especially on light tackle. We’re seeing more and more pargo as well…mostly the barred pargo and yellow pargo/ snapper, but all tough in the rocks and great eating. There were some nice surprises. A few times, we still got into dorado. 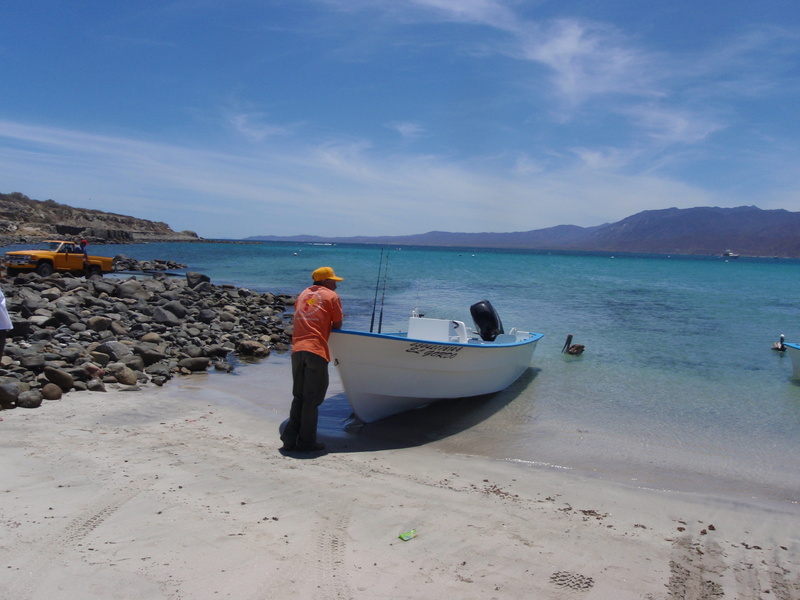 Good spots are east of Espiritu Santo Island; the south end of Cerralvo Island and around Punta Perrico especiallly on the south end in the ensenada curve by the old Hotel Las Arenas. If you can’t get bait, then trolling smaller feather or skipping the small plastic hoochies on the surface chop gets the strikes. If you only have a little bait, then get a hookup on the trolled lures or feathers then draw the fish in with the live bait! Also, if you’re willing to “go long” and maybe “get wet and bounced,” the north and south end of Cerralvo Island has kicked our some wahoo. 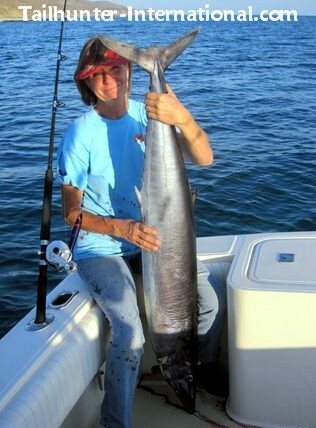 That’s a big surprise since this year the wahoo have been around, but just not biting. I think this year we only saw a handful. However, the last week or so, there were a few caught, but everyone talked about the long bumpy ride out there and the erratic seas and strong winds while trolling around. For some…it was worth it! Hope your Holidays are off to a good start!